As a young child, I was raised a Catholic and was even an altar boy. But I have been a confirmed atheist since I was about 14. However, I have a Mother who is a devote Catholic and many friends who have strong religious beliefs. Over the years, I have developed an “each to their own” philosophy when it comes to religion. You can’t say you have visit Salt Lake City unless you spend some time exploring the headquarters of the Church of the Latter-Day Saints (Mormon) commonly known as the Temple Square. Not only is Salt Lake City's sense of place closely tied to the Mormon Church, but so is its economy. In 2012 Reuters reported the Church had annual revenues of $7 billion from tithing and donations alone, with another $1.5 billion from its business enterprises. In total, it has assets estimated at $35 billion. However, the Square is really just a small walled area in downtown. It has five buildings - Assembly Hall, the Tabernacle, the Salt Lake Temple and two Visitor’s Centres (one focused on family and the other Jesus Christ). Outside the walls are the Joseph Smith Memorial Building, Lion House, Beehive House, Administrative Building, Office Building, History Library, a massive Conference Centre, History Museum and Family History Library. Thought, I haven’t been to any Silicon Valley high-tech company campuses, I imagine the Latter-Day Saints campus is much the same. The only building tourists can’t enter is the Salt Lake Temple; all the other buildings offer free tours or some form of public access. While the imposing blank stucco walled is not very pedestrian-friendly, I was told it was designed to muffle the sounds and distractions of the cars and people, thereby creating a more peaceful and contemplative place. It is true the square is very calm and relaxing; for the most part there is no running and no shouting. Surprisingly, there is also no graffiti on the exterior side of the blank walls. The Church of Jesus Christ of Latter-Day Saints Office Building at 26 floors, towers over the Temple campus. Its strong, vertical lines give it an uplifting skyscraper quality that is usually associated with much taller office buildings. The Salt Lake Temple makes a dramatic almost heavenly - some might say Disney-esque - statement at night. An ugly stucco wall guards Temple Square with just a single entrance on each of the three sides that face the outside world. The Square, more open on the east side, connects to the other church buildings on the same block. The remainder of the campus buildings face out onto the street. We entered at the South Visitor Centre and were quickly greeted - no surprise, as all of the Mormons always say “Hi” to you even in the street - and asked if we’d like a tour. While we are usually the self-guided tour types, we decided this time it might be good to get the “inside scoop” on the place and the people. After waiting about ten minutes, we were introduced to two young missionaries Sister Asay from Dallas and Sister Lopez from Mexico, our two tour guides. After a bit of chit chat, we were off to check out the model of the Salt Lake Temple (which we couldn’t go into) to learn about the different spaces inside and what kinds of things happened there. It is not your typical church with a big congregation area, but rather a series of rooms where you study and discuss your religious beliefs with more senior church members. You have to be a “member in good standing” to get in. We did question what that meant, but the answer was ambiguous. Then we went outside to the Assembly Hall, which in fact was the first Salt Lake church and built in 1889. This was followed by a tour of the Tabernacle (built 1875) next door, where the world-renowned Mormon Tabernacle Choir practises and performs. The building's exterior looks like a mid-century hockey arena with its oval-shape and curved roof. Inside are pews like any church and a balcony like a concert hall, with a huge stage that accommodates a full orchestra and a 300-person choir. The organ is one of the largest in the world with 11,623 pipes. There is minimal ornamentation in this building - the ceiling is just white plaster and the wall behind the organ is the same. We attended the free Thursday night rehearsal and the acoustics were great. Next it was the North Visitor Center, which houses a series of large paintings about the life of Christ. It reminded me of the Catholic Church’s stations of the cross. The paintings are competent, but I wouldn’t say they are outstanding; yet when I took pictures, a glow appeared around the head of Christ that was not there with the naked eye – a little eerie. You then walk upstairs and into the celestial room or at least that is what I call it. The walls and ceiling are painted like the universe with a 11-foot white sculpture of Christ in the middle of the room. We were there at noon and the sunlight was streaming in. It was visually stunning; there was a definite heavenly feeling to the space. This is the end of the tour for the standard 30 to 45 minute tour. But not for our 90+ minute tour! This is a model of the inside of Salt Lake Temple. You can see the six different spaces on ascending levels. We were told that as you move up the leadership ladder in the church, you get access to higher levels. This adds a whole new dimension to the term "working your way to the top." The Assembly Building is where church services take place. It has many of the original furnishings, including the pews. The Tabernacle building is where the Mormon Tabernacle choir rehearses and performs. You have to live within 100 miles of Salt Lake City to be in the choir. The blank white stucco walls and ceiling become a canvas for the projected light that is the background for the music and singing in the Tabernacle. A few of the Stations of the Cross-like paintings in the North Visitor Centre. Detail of one of the paintings in the North Visitor Centre. Note the aura around Christ's head. Statue of Christ in the celestial room on the second floor of the North Visitor Center makes a very powerful statement. This 11-foot statue titled "The Christus" is an exact replica of Danish sculptor Bertel Thorvaldsen's original in Copenhagen, Denmark. 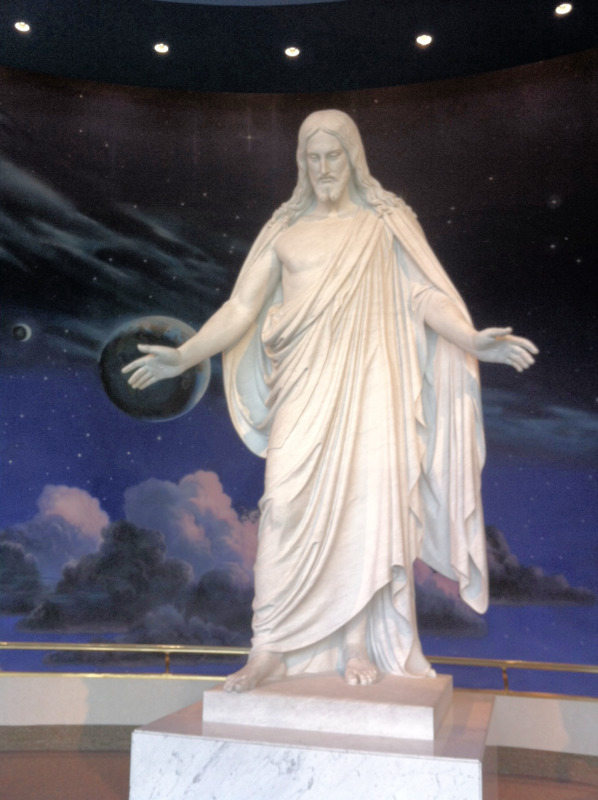 We were told a senior church member was so moved when he saw the original that he negotiated with the Church and the artist to commission the replica for Temple Square. Throughout the tour we were chatting with the delightful Sisters Asay and Lopez about the Mormon culture, their families and lifestyle, as well as sharing information on our families and religious beliefs. There was no pressure, no missionary zeal it was more like a first date as we keep asking each other to reveal some tidbit of information so we could get to know and understand each other better. I asked if they would like to join us for lunch. They said they would, but would have to ask for permission. I was shocked when they said yes they could join us. So, it was off to the Lion House's Pantry Restaurant for a quick, cafeteria-style lunch and more discussion. The conversation continued with the two Sisters being very forthright in answering more questions. For early 20 somethings, they were both very mature and articulate, moreso than most other young people we know. Lion House has a wonderful pantry restaurant that is popular with both tourists and workers on the Mormon Temple campus. Best buns in town! In fact, they truly are famous for their buns - soft dinner rolls with just a touch of sweetness. I was quickly introduced to a tour guide who said he’d show me inside which he did, and yes indeed there are three tiers each with 7,000 seats. At ten times the size of your average concert hall, it is an impressive sight. He then asked if I’d like to see the rooftop native species garden and off we went - so much for not wanting a tour! The views of the city and the valley from the rooftop are impressive. He informed me the church owned all of the buildings to the south of the campus which includes several major office buildings and a large residential tower. I then wandered the campus taking pictures of the other buildings, not daring to go inside, as I was toured-out. You could easily spend all day taking pictures and people-watching. The Conference Centre is impressive in its starkness and simplicity of design. The Conference Centre's rich red carpet, stage, seats and drapes creates an immediate sense of life, awe and passion, which I expect is perfect for the events that take place here. It was only when I got back to the hotel and collected my notes and photos that I realized I hadn’t taken a picture of our new best friends. Lucky me, the same evening we decided to check out the rehearsal at the Tabernacle. While standing in line, who should walk by but Sisters Lopez and Asay, a quick shout and there were big smiles all around. And, yes I got my picture of them with Brenda. I don’t know what the Catholic Church does at the Vatican in the way of museums and tours, but I can’t imagine it could be any better than what the Mormons do at their Salt Lake Temple campus. With over 170 young women from around the world studying there, they offer FREE tours in 30 languages year-round. Everything is free, including the Family Search centre where you can spend as much time as you want. You even get your own personal tutor to assist you with looking up your family history. Did I say it was all FREE? Throughout the tour, I was surprised at how similar all of the stories and beliefs of the Latter-Day Saints were to Catholicism. I was shocked there was no attempts to push their religion or beliefs on us. It was a very non-judgemental conversation about sharing one’s personal values, faith and beliefs. My take home message was that the Mormons have very strong commitment to family. Both Sisters, although only in their early 20s, were definite they would be getting married and having multiple children. I’ve not heard many early 20 somethings be so sure about getting married and having children. We even talked about marriage counselling, divorce and premarital relations. I couldn’t help but think the importance of family is not a bad thing. Too often we hear complaits about cities (suburban and urban) being unfriendly, unhappy and alienating places where nobody knows their neighbours. I can’t help but think part of the reason is that we have lost the sense of community which starts with a sense of family, as that is our first community. Too often the loss of sense of community in modern society is blamed on city design when it probably has more to do with a decline of the importance of family. Based on my limited sample size of family and friends, I have noticed that the stronger the nuclear family bond, the stronger sense of community they have. There was never an attempt to ask for a donation and in fact, there are no donation boxes anywhere on campus. Neither, is there is no requirement to give your contact information so they can hit you up later. How refreshing! San Miguel: A religious Experience of a lifetime.